We offer our clients various high quality LED Edge Light / Neon light displays that provide effective medium for many types of illuminated graphic messages. These incorporate logos, lettering symbols and other graphic elements to be displayed in fixtures mounted on counters or extend from walls, columns, or ceilings. Offering LED Board. The LED Board is of latest design and deliver quality performance along with long life. These are available in all the common size and standards. These are sturdy in nature and continue to deliver quality results in long term usage. We are dealing in South India only. Power Consumption: Very low almost 10% of Neon. Its works on DC power and diodes have no heating elements. Durability: Very high, it has no heating elements, LED is a semiconductor device. Water Proof: Yes, 100% waterproof, As LED modules are protected using silicon. Level of protection is IP67. Voltage: Low voltage, works on 12V DC. Brightness: High – about 25% lower than Neon. Safety: Very safe, since its on DC power very safe as it’s a DC device. Maintenance can be done even in online condition. Initial Cost: High initial capital cost as raw material is expensive. Cost of Ownership: Low, high initial price but no maintenance and higher life decreases your cost of ownership. A whole range of glow LED Signage is available with us. The LED Signage is of latest design and deliver quality performance along with long life. These are available in all the common size and standards. These are sturdy in nature and continue to deliver quality results in long term usage. 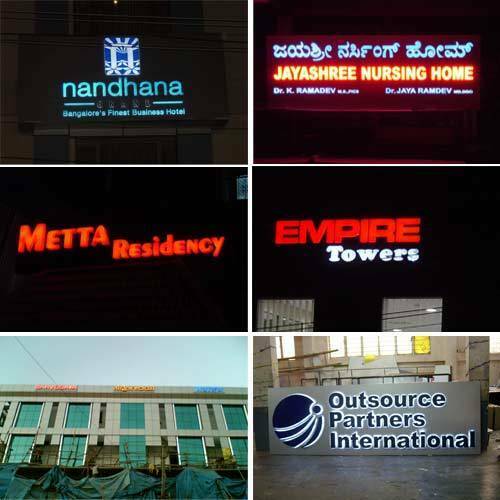 Due to their high quality and rusty finish, our LED Signage have highly been appreciated by clients from North & South India .We are dealing in South India only. We are the leading manufacturer and supplier of LED Sign Boards and we required buyers from all over india and we mostly entertain buyers having bulk order quantity orders . These boards are used for promotion , advertising and displays outside shops and in hoarding also . We are the leading manufacturer and supplier of indoor LED DISPLAY and we required buyers from all over india and we mostly entertain buyers having bulk order quantity orders .